Before the advent of big theme parks, an American vacation often included stops at roadside attractions. 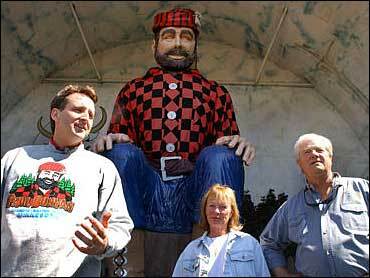 These might range from a 30-foot statue of Paul Bunyan to an alligator wrestling show. On The Early Show's "Best of America" series Friday, Ken Smith and Doug Kirby talk about some of the old-fashioned roadside attractions that still exist in America. Like Lucy the elephant, in Margate, N.J. - just outside of Atlantic City. Kirby says Lucy is one of their favorite walk-in animals on the East Coast. Smith notes, "Lucy is great because you can tour it; you can walk through it; and look out the windows. They bill it as the only elephant that you can go into and come out of alive. That's the tag line for Lucy." Kirby says his interest in roadside attractions makes him want to "document them and interview the people who have created them - take photos. And then share that with people around the world who may want to also visit these places." He and Smith have used the information they've collected to create roadsideamerica.com - a web site that chronicles and critiques thousands of quirky sites in all 50 states. On their site, you'll find information on the world's largest chest of drawers, found in High Point, N.C., or a donut shop shaped like a donut, found in La Puente, Calif.
Smith says, "I think people are always amazed when I talk to them that there is so much stuff out there for them to see. And every state of the Union has its share of bizarre attractions you can visit. "And I think people have the popular perception that this stuff just isn't out there anymore, but it is," he says. "I think our Web site is a wonderful way to sort of bring people in touch with that. And show them where they can go to look at this stuff that's still out there for them to marvel at." Kirby notes, "We've traveled about 300,000 miles in the pursuit of these kind of attractions. And we'll spend a 14-, 16-hour day just driving to ten or 15 places and trying to get as much of it as we can in one day." Both Kirby and Smith say they take numerous road trips each year. Along the way, they might stop to check out a go cart track built around a 65-foot Trojan horse or they may visit a funeral museum with coffins shaped like animals. Kirby says, "If the attraction is quirky or offbeat, we definitely think that's a plus. The toilet seat museum is a great example of innocent quirkiness. That's a gentleman, an artist, who is a retired plumber. He's been creating works of art on toilet seats. He's up over 600 toilet seats now." So whether you're looking to take in an old-fashioned mermaid show or to spend the night in a tee-pee motel, Kirby and Smith hope their Web site helps make your next trip a little more fun.